This article needs to be updated with material from Era Report: 3052, Handbook: House Liao, The Longest Road, Era Report: 3145, Technical Readout: 3145 Capellan Confederation, Historical: Wars of the Republic Era and Operational Turning Points: Capellan Crusades. Once this title clears the Moratorium period, or if it already has, please consider revisiting this article and updating it with the new material, removing this tag once all information has been added. Kai Allard-Liao (born 3030 – died 3113, aged 83 years) was the eldest child of Justin Allard and Candace Liao. As such, he stood to become the ruler of the St. Ives Compact, but his accession never came to pass because the Compact was forcibly reintegrated into the Capellan Confederation in 3063. He was the Solaris Grand Champion for two years during the middle 3050s, prompting many observers to declare him the best MechWarrior of his generation. Kai grew up in a fiercely competitive family, his father having once been Solaris Champion himself and his mother was also an accomplished MechWarrior. He attended the New Avalon Military Academy, where he met Victor Steiner-Davion during an exchange program. The two there formed the basis of a firm friendship, rare among nobility from neighboring nations. Before graduating from NAMA in 3049, Kai became the first cadet to score a draw against the incredibly difficult "La Mancha" simulator program. His tactics served as the basis that Victor used to become the first cadet to defeat the scenario while he was at the Nagelring. During his time at the academy, Kai's lack of self-confidence first made itself evident. Upon graduation, he joined service with the Federated Commonwealth's 10th Lyran Guards as a Lieutenant, a position he held when Victor joined the unit as Kai's battalion commander. They were both on the team that came up with a strategy to strike back at the Clans during the Clan invasion. It was during that battle in 3050 that he engineered the destruction of the Falcon Guards at the Great Gash on Twycross single-handed. He traveled with the other leaders and heirs of the Inner Sphere in 3051 to Outreach at the request of Jaime Wolf to learn about the Clans. On Outreach, Kai fought in a Clan-style Trial of Position and defeated an unprecedented five of his six opponents, including Prince Hanse Davion before falling to Jaime himself. 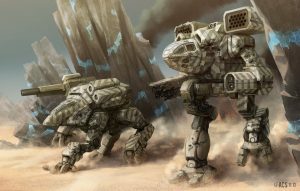 He turned down Jaime's offer of the Daishi he had piloted to keep Yen-Lo-Wang, the CN 9AH Centurion that had been his father's 'Mech. Hanse Davion insisted on rewarding his performance, and upgraded Yen-Lo-Wang with newly rediscovered Star League technology derived from the Helm Memory Core. In 3052, Kai found himself trapped behind enemy lines on Alyina after he sacrificed himself to ensure Victor was alive and able to retreat. With the help of Clan Jade Falcon forces who had initially captured him, Kai struck back at ComStar troops who attempted to gain control of the Inner Sphere through Primus Myndo Waterly's Operation SCORPION. After aiding the Falcon troops, Kai was allowed to return home, only to encounter the news that his father had been assassinated by an agent sent by Chancellor Romano Liao. Kai traveled to Solaris VII in 3053. In 3054 he challenged and defeated then-champion Jason Bloch, but refused to duel him again for the title, letting it lie vacant instead. Like his father, Kai became the Solaris Champion, a title he held from 3055 to 3056. Solarans widely speculated that Kai would go on to surpass Gray Noton's legendary seven-year reign as Solaris Champion, but Kai retired after only two years on top. It was during this time that Kai mostly overcame his chronic self-doubt and married Dr. Deirdre Lear. He also took control of his uncle Tormano Liao's Free Capella organization. Under Kai's aegis, Free Capella transformed from a revolutionary organization into an aid agency. Tormano was incensed at what his nephew had done, so he took back control of the organization he had founded to oppose tyranny in the Capellan Confederation. In 3059, he led the First St. Ives Lancers during Operation Bulldog. He was in command for the liberation of Tarazed and took part in the battles for Caripare and Schuyler. After the end of the operation, he joined Victor Steiner-Davion in the mop-up action on Huntress and for the Great Refusal on Strana Mechty in 3060, wherein piloting a Stormcrow he defeated Khan Vlad Ward of Clan Wolf and achieved a draw against the Wolf Binary. While away from the Inner Sphere, rogue units of the St. Ives military under the command of a Capellan spy attempted to capture or assassinate then-First Lord and Chancellor Sun-Tzu Liao on the planet Hustaing. This prompted the deployment of Star League Peacekeepers to several Compact worlds to ensure that no further provocations took place. Unfortunately, their presence only escalated the violence and on 20 February 3061, war was formally declared between the Capellan Confederation and the St. Ives Compact. Upon returning to the Inner Sphere in April 3061, Kai became an active participant in the defense of his homeland against the Capellan Confederation. He accompanied his mother, Duchess Candace, to the Second Whitting Conference where the St. Ives Compact successfully petitioned for Star League Defense Force assistance against what was by then a full-fledged war. At least three regiments of the elite Eridani Light Horse were confirmed being sent to aid the St. Ives Compact. Kai Allard-Liao's military contributions began in a raiding campaign against CCAF supply lines deep behind enemy lines. He led his 1st St. Ives Lancers to significant victories in Sarna and Necromo before being ambushed in Capella. Too badly damaged to continue, the 1st St. Ives Lancers returned for refit in time to participate in the defense of St. Ives. Outnumbered 3-1, the defenders of the realm's capital were steadily beaten down until the planet fell with the evacuation of Duchess Candace Liao. Kai and his regiment spent the remainder of the war along the Teng Front until peace was declared. Kai was released on his honor by his cousin Chancellor Sun-Tzu Liao to help Victor regain his throne from his sister Katherine. Kai led a portion of the 1st St. Ives Lancers to Victor's aid, meeting up with him on Tikonov in the fall of 3066. He participated with Victor's campaign on New Avalon between 3066-3067. On 25 June 3068 he was abducted from St. Ives by the Bounty Hunter and was sighted in the company of Duke George Hasek of the Federated Suns just prior to the Duke's assault against the Capellan Confederation. Duke Hasek claimed to be launching the assault in the name of the fallen St. Ives Compact and Kai, though it was not clear Kai participated willingly. By removing Kai from the Confederation, Hasek also removed a potential enemy. On 15 June 3069, he was "rescued" by Death Commandos during the Capellan counterattack. In the aftermath of the Jihad Kai found himself to be in a very different position to the leadership of the various Capellan Commonalities - including the remaining senior figures within the St. Ives Commonality. Kai believed that regardless of exactly how the Republic of the Sphere had subsumed control of a number of former Capellan worlds, contesting control of those worlds wouldn't be worth the cost in lives that would ultimately ensue. With the Chancellor staunchly opposed to the Republic and strongly nationalistic feelings sweeping the Confederation, Kai's position was increasingly isolated; his son David speculated that the reason Kai spent so much time in the field with the 1st St. Ives Lancers in the early 3080s was to avoid the political atmosphere in the St. Ives court. In mid-3081 Kai was facing many calls to retire from those even inside his personal command; while Kai's calls for peace differed from the desires of those within the St. Ives Armored Cavalry, those who criticised him cited the idea that Kai had become emotionally exhausted after more than twenty years of continual warfare, rather than questioning his loyalty to the Confederation. His subsequent actions currently remain unknown, however he was killed in 3113 on Liao during the Capellan Crusades while fighting for the Republic of the Sphere. Kai left his legendary 'Mech, Yen-Lo-Wang, to his great-niece, Danai Liao-Centrella, who also went on to become a Solaris combatant. Kai married Dr. Deirdre Lear, a pacifistic physician in the mid-3050s and had two children: David Lear and Melissa Liao-Allard. David Lear was in the same reeducation camp as Devlin Stone and worked with him to liberate the camp and create the Kittery Prefecture. It was through Lear that Stone was able to meet Kai and other Inner Sphere leaders. Allard-Liao most famously used Yen-Lo-Wang, a modified Centurion, for much of his career. He occasionally used other 'Mechs for specific purposes, piloting a Penetrator in an important duel on Solaris in 3056. He piloted also this mech during Operation Bulldog, with great success. He also used a Stormcrow in the B configuration during the Great Refusal. During the final test of his training on Outreach, he piloted a Dire Wolf, eliminating five elite opponents. He was piloting a Hatchetman when he destroyed the Falcon Guard during the Battle of Twycross. ↑ Masters and Minions: The StarCorps Dossiers, p. 51 - "House Liao Key Personalities"
↑ Era Report: 3145, p. 87, "Danai Profile"
↑ 6.0 6.1 MechWarrior's Guide to Solaris VII, p. 64, "Kai Allard-Liao"
↑ 10.0 10.1 Jihad Hot Spots: 3070, pp. 16-17 & Blake Ascending, pp. 176-177, "Timeline of the Jihad"
↑ Jihad Secrets: The Blake Documents, p. 17, "Precursor"
↑ Jihad Hot Spots: 3072, p. 16, "Timeline of the Jihad"
↑ Jihad: Final Reckoning, p. 102, "The Political Landscape Of The Capellan Confederation"
↑ Jihad: Final Reckoning, p. 99, "The St. Ives Armored Cavalry"
↑ 15.0 15.1 Field Manual: 3085, p. 25 "The Capellan Confederation - St. Ives Armored Cavalry"
↑ Field Manual: 3085, p. 20 "The Capellan Confederation - General Review - A Broken Home"
↑ Field Manual: 3085, p. 20 "The Republic of the Sphere - The RAF - Hastati Sentinels"
↑ MechWarrior's Guide to Solaris VII, p. 68 "A Brief History of Solaris VII - Solaris City"
↑ Blood Legacy, p. ?? This page was last edited on 3 March 2019, at 23:33.